May 24, 2018 (Gales Ferry, CT) – The New England Street Outlaw Series will suspend operations of their 2018 Fast Lane Friday schedule at the New London-Waterford Speedbowl, effective immediately. The New England Street Outlaw Series has sanctioned, promoted and overseen the Fast Lane Friday events at the Speedbowl since last season. The sanctioning body had originally planned a 16-event season in 2018 at the Speedbowl. The first event of the season was held last week. The decision to suspend operations was due to multiple factors involving the relationship between the New England Street Outlaw Series management and management team of the New London-Waterford Speedbowl. Attempts to resolve concerns over pending issues were unsuccessful and management determined it was in the best interest of organizers and competitors to suspend the season. Management of the New England Street Outlaw Series is deeply disappointed to have reached this decision. We would like to thank all of our racers, fans, sponsors and partners who have supported our efforts. Street Class racers Heidi Bradham (left) in her 1980 Chevy Camaro lined up against Alec DeRosier (right) in his 1998 Ford Mustang GT await the green light to race down the track at Thompson Speedway on Saturday, July 18, 2015. Photo Credit: Corey Smiley Photography. 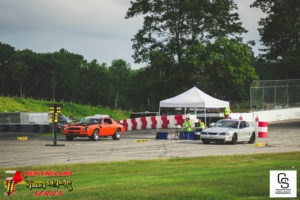 Gales Ferry, CT (September 11, 2015) – Building off the excitement and buzz of inaugural NESOS event in July, both spectators and over 65 racers flocked to Thompson Speedway Motorsports Park on Saturday, August 15th to make the second event a success. The temporary 250’ drag racing track placed on the oval back straight showcased three classes of spectator drag racing with large fields in all classes; Hoyle, O’Donal and Cannamela declared winners of $1,200 purse event. As Elimination Rounds were being completed a storm front with intensifying lightening was making its way towards the famed 5/8 mile oval at Thompson. The lightening finally reached a point of endangering fans, competitors, track crew and track equipment. NESOS Officials along with Thompson Officials were forced to end the event for everyone’s safety early as semi-final rounds were set to race. After much discussion with the NESOS and Thompson Officials it was determined there was no availability to conclude the August event. A mathematical equation was formulated to ensure the most fair finishing position among the remaining competitors. Using factors that included racers closest to their dial-in times and reaction times from the previous elimination round, winners were declared based on their overall combined scores. Making the uncompleted Final Round in the Bike Class were veteran racers Joseph Merchant on his 1982 Honada Hawk paired against veteran rider Ron Hoyle of Baltic on his 2000 Polaris XCSP Snowmobile. Hoyle with an average over-dial of 0.1484 and RT of .05194 was given a score of .20034. This would best Merchant with an over-dial of .25231 and RT of .03644 giving a score of .28875. This was both Merchants and Hoyle’s first event of 2015 with the NESOS and first NESOS win for Hoyle. Making the uncompleted Semi-Final and Final Round in the Street Class were second year competitor Aaron Sypher Piper of Clinton in his 2002 VW Bug and first time racers Mark Green of Waterbury in his 2011 GMC Denali and John O’Donal of Colchester in his 1993 Ford F-150 Lightning. O’Donal with an average over-dial of 0.16613 and RT of .06669 was given a score of .23282. This would outperform Green with a over-dial of .08876 and RT of .14762 giving a score of .23638 and Sypher with a over-dial of .22273 and RT of .18777 giving a score of .41050. This was all three competitors first event of 2015 with the NESOS and O’Donal’s first career win. Making the uncompleted Semi-Final and Final Round in the Competition Class was mix of veterans and new competitors. On the starting line as the event was cancelled was Mark Cannamela of Preston in his 1968 Camaro paired against Albert Rondeau of Baltic in his 1974 Vega. Waiting in staging to race as the event was cancelled was Butch Kolashuk of Waterford in his 1957 Ford T-Bird paired against John Sugrue of Stratford in his 1957 Chevy 2-Door Wagon. Cannamela with an average over-dial of 0.01568 and RT of .23359 was given a score of .24927. This would outperform Rondeau with an over-dial of .00237 and RT of .24759 giving a score of .24996 making these the closet scores of all uncompleted events. Kolashuk with an over-dial of .07312 and RT of .19774 giving a score of .27086 for third and Sugrue would finish fourth with an over-dial of 1.07252 and RT of .82350. This would become Cannamela’s first career win with the NESOS. Fastest Overall Elimination RT: 01520 – #288 Jason Barba (Bike), 1986 Suzuki LT250R. Fastest Overall Elimination ET: 61237 – #1734 Albert Rondeau (Comp), 1974 Chevy Vega. Fastest Overall Elimination MPH: 51 – #1734 Albert Rondeau (Comp), 1974 Chevy Vega. The NESOS would like to thank Thompson Speedway for hosting our event and Waddell Communications for supplying radio communication equipment for the track crew. Event sponsors for the $1,200 payout included Gary Bingham, Horse Power Farm, Caplet’s Heavy Equipment Repair LLC and R&G Seal Coating. Special thanks to Eric Pratt and Anthony Pierro for their contributions to making this event take place. If you are interested in becoming a sponsor of the NESOS or our events please contact us. Complete 8/15/15 Elimination Round Results can be found at NEStreetOutlaws.com. For more information and announcements forthcoming please be sure to visit NEStreetOutlaws.com and follow NESOS on Facebook. The New England Street Outlaw Series is based in New England and features exciting spectator drag racing events at various regional venues. From asphalt to dirt, from 100 feet to 1/8 mile strip the NESOS can handle any size venue with its temporary electronic track system complete with sensors and a professional drag racing tree. We bring the drag racing to you! For more information or to setup a public event or book private events please visit NEStreetOutlaws.com or email Info@NEStreetOutlaws.com. The series is promoted, managed and owned by Thirty Marketing. Thompson Speedway Motorsports Park is one of the oldest continuously operating motorsports facilities in the country, with 2015 marking its 75th anniversary. It provides a wide range of facilities for drivers and automotive enthusiasts including NASCAR racing on its 5/8 mile paved oval, a 1/10 mile quarter midget track, the recently re-opened 1.7 mile road course, the Clubhouse restaurant with catering and banquet facilities, as well an 18-hole championship golf course.